After our success with the Interact VR product evaluation app, we wondered how we could take our new found capabilities in virtual reality and use them to bridge the gap between the virtual and real world. We looked at both available technologies and our clients’ needs and decided to develop a tool that would allow us to control a device in the real world through a virtual reality interface. In the end, we settled on a robot arm that could be intuitively controlled through a virtual reality app as a proof of concept for our objective. To build this system quickly and efficiently we took advantage of the rapid prototyping tools and the iterative, flexible, and interdisciplinary design process we pride ourselves on here at 219 Design. Mathematical modeling, MATLAB simulation, computer aided design, open source electronics hardware, 3D printing, and rapid fabrication methods were all critical to the success of this project. We now have a virtual reality app that allows for precise and intuitive control of a robot arm. The app allows not only for real time robot control, but also the ability to easily record a motion path that the robot arm can later follow on command. In this way the user can “teach” the robot arm a desired behavior without any advanced programming knowledge. Recording a new behavior is as easy as pressing a record button, grabbing the robot arm end effector in VR, and dragging it in 3D space. For this proof of concept, our robot arm is quite small, but this same procedure could also be used to program powerful industrial robots. Imagine a factory that could be entirely designed and programmed in VR, including all of its machine actions. Instead of needing a specialist in industrial robots to spend lot of time and effort coding the behavior of the robot arm at a low level, with this infrastructure, anyone could easily and quickly program – or reprogram – the robot’s behavior effortlessly. 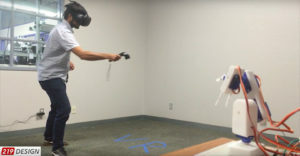 Companies have developed systems that use the idea of easy programmability of robot arms, but few have taken advantage of the intuitive and immersive qualities of virtual reality thus far. A virtual reality control system also allows for interaction with robotic systems that are remote or even hazardous for humans. For example, a surgeon in California could intuitively perform an operation on a patient in Tokyo without any previous intensive training on robot control. 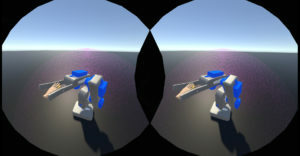 Though this project was simply a proof of concept, we developed institutional knowledge about how to connect the virtual and real worlds through the process of building the VR robot arm system. 219 Design is confident that the experience we gained designing this innovative tool will be useful to our clients. Our hope is that this project inspires other engineers to develop systems that integrate the intuitiveness of virtual reality with the precision and power of robotics.